What a fun time I have had making this purse! It certainly came out being a very unique, and one of a kind. I found the book It's A Wrap by Susan Breier and just had to get started. I am certainly one for reading directions, but will admit I just found the size I wanted, read the intro on how to get started and the process. Then I threaded up the vintage Dressmaker (what a super workhorse!) and started. At first it was a lot of breaking of needles, so sure I was doing something wrong but I finally inserted a size 19! Worked! I did take the liberty and added some lining to the purse, and the inside pockets. Put the magnetic purse snap on, and ready to go! Now just need to find a unique vintage button to cover the snap and I am finished. 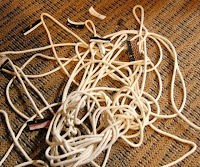 Did take a little while, and left quite a mess with my cording. Clean up time! I did experiment with various attachments, and used both my presser foot and at times the walking foot. Was happy with both. New experiences are always fun!